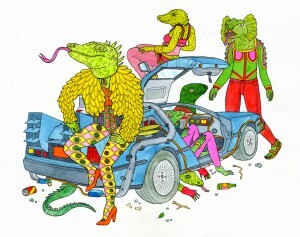 Lisa Hanawalt is a New York-based artist whose illustrations feature humans and anthropomorphic animals in a variety of artistic styles, all in the service of the creator’s wry observations of pop culture and human foibles. Her works have been seen in a variety of publications and on a variety of web sites, as you can see if you visit her home page or her shop on Tumblr. Well now, her works have been gathered together on dead trees in a new hardcover collection, My Dirty Dumb Eyes from Drawn & Quarterly. Check it out at Amazon. It’s also available as a trade paperback.